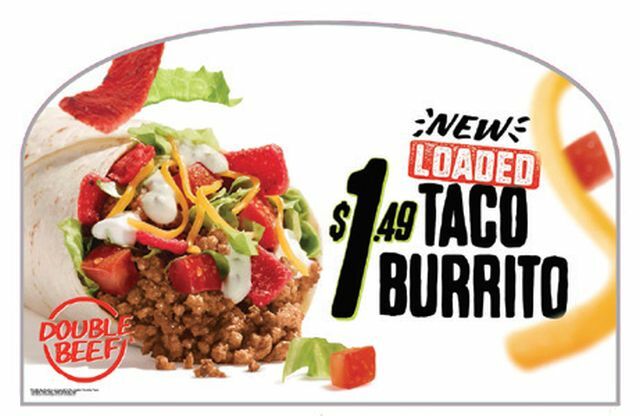 Taco Bell Testing Value-Priced "Taco Burrito"
Taco Bell looks to offer a taco inside of a burrito for the test of the new $1.49 Loaded Taco Burrito out in Toledo, Ohio. As the name suggests, the test item consists of a double-portion of seasoned ground beef, lettuce, tomato, shredded cheese, red tortilla strips, and reduced fat sour cream wrapped up inside of a flour tortilla. It's basically the filling of their Taco Supreme but wrapped up in a burrito with tortilla strips standing in for the hard taco shell. In addition to the $1.49 price point, the Loaded Taco Burrito is also being offered as part of a $5 Big Box meal along with a Crunchy Taco, a Doritos Locos Taco, and a medium drink. While the burrito doesn't introduce any new ingredients (or bring back any old ones), it does make for a rather nice value and fits in with Taco Bell's strategy of monthly limited-time specials.